Angling your take off allows a surfer to drop in on waves that are steep. On larger surfboards the curvature of the wave is too steep for the length and rocker of the board and often results in a nose dive (pearling). By angling your board as you paddle for a wave this will set the line that your board will take. The benefit of this technique is that you no longer need to trim as your board as aggressively once standing up and dropping down the wave. Trimming your board when at the bottom of the wave is hard as you will need to lean heavily in the direction that you wish to travel. Without your weight over the correct part of the board (fins) a surfer will simply fall forwards over their toes, landing on their face. HOW TO ANGLE YOUR TAKE OFF? Step One. 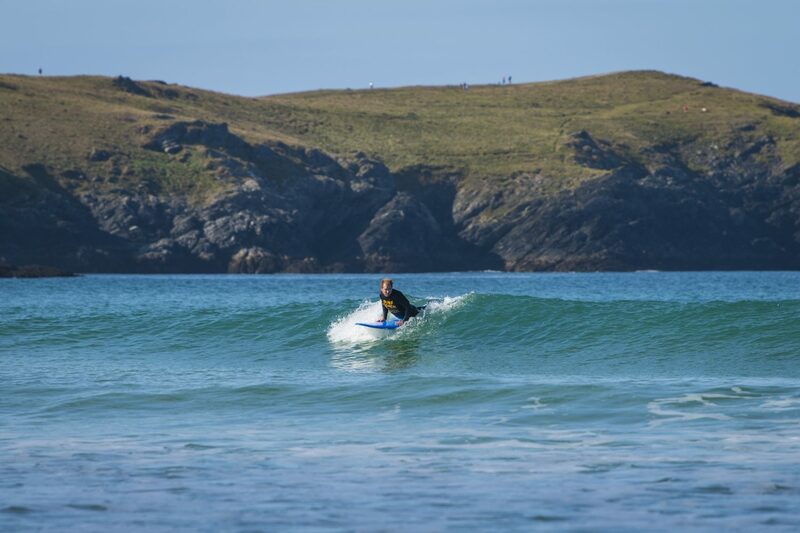 Once a potential wave is spotted and you have built up your paddle speed, slightly angle your board in the direction that the wave will break. *Too much angle can result in you missing the wave due to paddling away from the peak – here timing and positioning is very important. Step Two. In your final stages of paddling, start to lean with your chest on the side of the board that you wish to travel, whilst doing this paddle with one or two sweeping strokes with the arm opposite of the direction you are wanting to go. Step Three. As you pop up, keep your head and body pointing in the direction that you wish to travel, apply slight pressure on the inside rail of your surfboard so that this rail digs in to the wave face. Step Four. Make sure that you place your board in the top third or middle of the wave face. Surfing on the wave too high up at an angle can lead to you surfing off the back of the wave. Too slight of an angle will lead to surfing towards the beach. Many new or developing surfers will often find themselves either surfing off the back of the wave or more commonly finding themselves with no speed at the bottom of the wave. Ideally a surfer should be surfing from the top of the wave to the bottom of the wave to maximise speed generation and execution of manoeuvres in critical sections of the wave. Each section of the wave provides the surfer with different opportunities to generate speed and place manoeuvres. Top: The top section the wave is the fastest part of the wave and is where all the speed can be found. Middle: This section of the wave can be somewhat of a no mans land for surfers and can be viewed as an area of transition between bottom turns and manoeuvres in the the top third of the wave. Bottom: This part of the wave is known as the trough and is the slowest part of the wave. Generating speed gives a whole new lease of life to your surfing and is a definite sign your surfing is reaching its next level. Generating speed means making your surfboard move faster through manipulating the wave face, your body movements and parts of the board – combined, and in rhythm you will generate horizontal down the line speed. Compression and extension – The most basic movements when generating speed on a surf board come from compression and extension. As you drop into a wave your body becomes compressed – potential energy gained from this is then transformed into kinetic energy and eventually forward momentum. Releasing this energy in the direction of travel by combining arm throws and extending your body will un-weight the surfboard making it jump horizontally (forward), repeated over and over your board will gain more lift and more speed. Step One. As you reach the trough of a wave extend your body so you are nearly standing straight, at the same time lift your arms up to shoulder level. Step Two. Project your body in the direction of travel and place your board in the top third of the wave. Step Three. Drop down the wave face once more and compress your body slightly, bringing your arms back down to your side. Action: A great warm up exercise or land based way to practise the movements needed for generating speed can be to practice standing start arm throws. Step one. Stand two feet together with your arms by your side, look over one shoulder and swing your arms simultaneously in the same direction that you are looking. This should result in the momentum of your arms leading and the rest of your body following. Step two. Add a slight leg compression and at the same time, throw your arms extend your legs. You’ll notice a big difference on the amount of momentum and distance that you can cover. It is this compression and extension movement that are part of the fundamental movements required to transfer potential energy into board speed.